Spirit, also known as MER-A (Mars Exploration Rover – A) or MER-2, is a robotic rover on Mars, active from 2004 to 2010. It was one of two rovers of NASA's Mars Exploration Rover Mission. It landed successfully on Mars at 04:35 Ground UTC on January 4, 2004, three weeks before its twin, Opportunity (MER-B), which landed on the other side of the planet. Its name was chosen through a NASA-sponsored student essay competition. The rover became stuck in a "sand trap" in late 2009 at an angle that hampered recharging of its batteries; its last communication with Earth was sent on March 22, 2010. The rover completed its planned 90-sol mission. Aided by cleaning events that resulted in more energy from its solar panels, Spirit went on to function effectively over twenty times longer than NASA planners expected. Spirit also logged 7.73 km (4.8 mi) of driving instead of the planned 600 m (0.4 mi), allowing more extensive geological analysis of Martian rocks and planetary surface features. Initial scientific results from the first phase of the mission (the 90-sol prime mission) were published in a special issue of the journal Science. On May 1, 2009 (5 years, 3 months, 27 Earth days after landing; 21.6 times the planned mission duration), Spirit became stuck in soft sand. This was not the first of the mission's "embedding events" and for the following eight months NASA carefully analyzed the situation, running Earth-based theoretical and practical simulations, and finally programming the rover to make extrication drives in an attempt to free itself. These efforts continued until January 26, 2010 when NASA officials announced that the rover was likely irrecoverably obstructed by its location in soft sand, though it continued to perform scientific research from its current location. The rover continued in a stationary science platform role until communication with Spirit stopped on March 22, 2010 (sol 2208). JPL continued to attempt to regain contact until May 24, 2011, when NASA announced that efforts to communicate with the unresponsive rover had ended, calling the mission complete. A formal farewell took place at NASA headquarters shortly thereafter. The Jet Propulsion Laboratory (JPL), a division of the California Institute of Technology in Pasadena, manages the Mars Exploration Rover project for NASA's Office of Space Science, Washington. The primary surface mission for Spirit was planned to last at least 90 sols. The mission received several extensions and lasted about 2,208 sols. 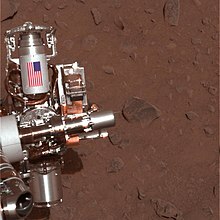 On August 11, 2007, Spirit obtained the second longest operational duration on the surface of Mars for a lander or rover at 1282 Sols, one sol longer than the Viking 2 lander. Viking 2 was powered by a nuclear cell whereas Spirit is powered by solar arrays. Until Opportunity overtook it on May 19, 2010, the Mars probe with longest operational period was Viking 1 that lasted for 2245 Sols on the surface of Mars. On March 22, 2010, Spirit sent its last communication, thus falling just over a month short of surpassing Viking 1's operational record. An archive of weekly updates on the rover's status can be found at the Spirit Update Archive. Spirit's total odometry as of March 22, 2010 (sol 2210) is 7,730.50 meters (4.80 mi). Search for and characterize a variety of rocks and soils that hold clues to past water activity. In particular, samples sought will include those that have minerals deposited by water-related processes such as precipitation, evaporation, sedimentary cementation or hydrothermal activity. NASA sought evidence of life on Mars, beginning with the question of whether the Martian environment was ever suitable for life. Life forms known to science require water, so the history of water on Mars is a critical piece of knowledge. Although the Mars Exploration Rovers did not have the ability to detect life directly, they offered very important information on the habitability of the environment during the planet's history. The piece of metal with the American flag on Spirit's rock abrasion tool is made of aluminum recovered from the site of the World Trade Center towers. 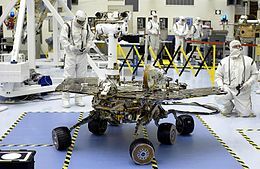 Spirit (and its twin, Opportunity) are six-wheeled, solar-powered robots standing 1.5 meters (4.9 ft) high, 2.3 meters (7.5 ft) wide and 1.6 meters (5.2 ft) long and weighing 180 kilograms (400 lb). Six wheels on a rocker-bogie system enable mobility over rough terrain. Each wheel has its own motor. The vehicle is steered at front and rear and is designed to operate safely at tilts of up to 30 degrees. Maximum speed is 5 centimeters per second (2.0 in/s); 0.18 kilometers per hour (0.11 mph), although average speed is about 1 centimeter per second (0.39 in/s). Both Spirit and Opportunity have pieces of the fallen World Trade Center's metal on them that were "turned into shields to protect cables on the drilling mechanisms". The Spirit Mars rover and lander arrived successfully on the surface of Mars on 04:35 Ground UTC on January 4, 2004. This was the start of its 90-sol mission, but solar cell cleaning events would mean it was the start of a much longer mission, lasting until 2010. Spirit was targeted to a site that appears to have been affected by liquid water in the past, the crater Gusev, a possible former lake in a giant impact crater about 10 km (6.2 mi) from the center of the target ellipse at 14°34′18″S 175°28′43″E﻿ / ﻿14.5718°S 175.4785°E﻿ / -14.5718; 175.4785. After the airbag-protected landing craft settled onto the surface, the rover rolled out to take panoramic images. These give scientists the information they need to select promising geological targets and drive to those locations to perform on-site scientific investigations. The panoramic image below shows a slightly rolling surface, littered with small rocks, with hills on the horizon up to 3 kilometers (1.9 mi) away. The MER team named the landing site "Columbia Memorial Station," in honor of the seven astronauts killed in the Space Shuttle Columbia disaster. "Sleepy Hollow," a shallow depression in the Mars ground at the right side of the above picture, was targeted as an early destination when the rover drove off its lander platform. NASA scientists were very interested in this crater. It is 9 meters (30 ft) across and about 12 meters (39 ft) north of the lander. First color image compiled from images by Spirit; it was the highest resolution color image taken on another planet. The MER pancams are black-and-white instruments. Thirteen rotating filter wheels produce multiple images of the same scene at different wavelengths. Once received on Earth, these images can be combined to produce color images. On January 21, 2004 (sol 17), Spirit abruptly ceased communicating with mission control. The next day the rover radioed a 7.8 bit/s beep, confirming that it had received a transmission from Earth but indicating that the craft believed it was in a fault mode. Commands would only be responded to intermittently. This was described as a very serious anomaly, but potentially recoverable if it were a software or memory corruption issue rather than a serious hardware failure. Spirit was commanded to transmit engineering data, and on January 23 sent several short low-bitrate messages before finally transmitting 73 megabits via X band to Mars Odyssey. The readings from the engineering data suggested that the rover was not staying in sleep mode. As such, it was wasting its battery energy and overheating – risk factors that could potentially destroy the rover if not fixed soon. On sol 20, the command team sent it the command SHUTDWN_DMT_TIL ("Shutdown Dammit Until") to try to cause it to suspend itself until a given time. It seemingly ignored the command. The leading theory at the time was that the rover was stuck in a "reboot loop". The rover was programmed to reboot if there was a fault aboard. However, if there was a fault that occurred during reboot, it would continue to reboot forever. The fact that the problem persisted through reboot suggested that the error was not in RAM, but in either the flash memory, the EEPROM, or a hardware fault. The last case would likely doom the rover. Anticipating the potential for errors in the flash memory and EEPROM, the designers had made it so that the rover could be booted without ever touching the flash memory. The radio itself could decode a limited command set – enough to tell the rover to reboot without using flash. Without access to flash memory the reboot cycle was broken. On January 24, 2004 (sol 19) the rover repair team announced that the problem was with Spirit's flash memory and the software that wrote to it. The flash hardware was believed to be working correctly but the file management module in the software was "not robust enough" for the operations the Spirit was engaged in when the problem occurred, indicating that the problem was caused by a software bug as opposed to faulty hardware. NASA engineers finally came to the conclusion that there were too many files on the file system, which was a relatively minor problem. Most of these files contained unneeded in-flight data. After realizing what the problem was, the engineers deleted some files, and eventually reformatted the entire flash memory system. On February 6 (sol 32), the rover was restored to its original working condition, and science activities resumed. For the first intentional grinding of a rock on Mars, the Spirit team chose a rock called "Adirondack". To make the drive there, the rover turned 40 degrees in short arcs totaling 95 centimetres (37 in). It then turned in place to face the target rock and drove four short moves straightforward totaling 1.9 m (6 ft 3 in). Adirondack was chosen over another rock called "Sashimi", which was closer to the rover, as Adirondack's surface was smoother, making it more suitable for the Rock Abrasion Tool (aka "RAT"). Spirit made a small depression in the rock, 45.5 millimetres (1.79 in) in diameter and 2.65 millimetres (0.104 in) deep. Examination of the freshly exposed interior with the rover’s microscopic imager and other instruments confirmed that the rock is volcanic basalt. On March 5, 2004, NASA announced that Spirit had found hints of water history on Mars in a rock dubbed "Humphrey". Raymond Arvidson, the McDonnell University Professor and chair of Earth and Planetary Sciences at Washington University in St. Louis, reported during a NASA press conference: "If we found this rock on Earth, we would say it is a volcanic rock that had a little fluid moving through it." In contrast to the rocks found by the twin rover Opportunity, this one was formed from magma and then acquired bright material in small crevices, which look like crystallized minerals. If this interpretation holds true, the minerals were most likely dissolved in water, which was either carried inside the rock or interacted with it at a later stage, after it formed. On sol 65 March 11, 2004, Spirit reached Bonneville crater after a 400-yard (370 m) journey. This crater is about 200 meters (220 yd) across with a floor about 10 meters (11 yd) below the surface. JPL decided that it would be a bad idea to send the rover down into the crater, as they saw no targets of interest inside. Spirit drove along the southern rim and continued to the southwest towards the Columbia Hills. Spirit reached Missoula crater on sol 105. The crater is roughly 100 yards (91 m) across and 20 yards (18 m) deep. Missoula crater was not considered a high priority target due to the older rocks it contained. The rover skirted the northern rim, and continued to the southeast. It then reached Lahontan crater on sol 118, and drove along the rim until sol 120. Lahontan is about 60 yards (55 m) across and about 10 yards (9.1 m) deep. A long, snaking sand dune stretches away from its southwestern side, and Spirit went around it, because loose sand dunes present an unknown risk to the ability of the rover wheels to get traction. Spirit drove from Bonneville crater in a direct line to the Columbia Hills. The route was only directly controlled by the engineers when the terrain was difficult to navigate; otherwise, the rover drove in an autonomous mode. On sol 159, Spirit reached the first of many targets at the base of the Columbia Hills called West Spur. Hank's Hollow was studied for 23 sols. Within Hank's Hollow was the strange-looking rock dubbed "Pot of Gold". Analysing this rock was difficult for Spirit, because it lay in a slippery area. After a detailed analysis with the AXPS-and the Mößbauer instrument it was detected that it contains hematite. This kind of rock can be built in connection with water. As the produced energy from the solar panels was lowering due to the setting sun and dust the Deep Sleep Mode was introduced. In this mode the rover was shut down completely during the night in order to save energy, even if the instruments would fail. The route was selected so that the rover's panels were tilted as much as possible towards the winter sun. From here, Spirit took a northerly path along the base of the hill towards the target Wooly Patch, which was studied from sol 192 to sol 199. By sol 203, Spirit had driven southward up the hill and arrived at the rock dubbed "Clovis". Clovis was ground and analyzed from sol 210 to sol 225. Following Clovis came the targets of Ebenezer (Sols 226–235), Tetl (sol 270), Uchben and Palinque (Sols 281–295), and Lutefisk (Sols 296–303). From Sols 239 to 262, Spirit powered down for solar conjunction, when communications with the Earth are blocked. Slowly, Spirit made its way around the summit of Husband Hill, and at sol 344 was ready to climb over the newly designated "Cumberland Ridge" and into "Larry's Lookout" and "Tennessee Valley". Spirit also did some communication tests with the ESA orbiter Mars Express though most of the communication was usually done with the NASA orbiters Mars Odyssey and Mars Global Surveyor. Spirit had now been on Mars for one Earth year and was driving slowly uphill towards the top of Husband Hill. This was difficult because there were many rocky obstacles and sandy parts. This lead frequently to a slippage and the route could not be driven as planned. In February Spirit's computer received a software update in order to drive more autonomously. On sol 371, Spirit arrived at a rock named "Peace" near the top of Cumberland Ridge. Spirit ground Peace with the RAT on sol 373. By sol 390 (mid-February 2005), Spirit was advancing towards "Larry's Lookout", by driving up the hill in reverse. The scientists at this time were trying to conserve as much energy as possible for the climb. Spirit also investigated some targets along the way, including the soil target, "Paso Robles", which contained the highest amount of salt found on the red planet. The soil also contained a high amount of phosphorus in its composition, however not nearly as high as another rock sampled by Spirit, "Wishstone". Squyres said of the discovery, "We're still trying to work out what this means, but clearly, with this much salt around, water had a hand here". Martian sunset by Spirit at Gusev crater, May 19, 2005. On March 9, 2005 (probably during the Martian night), the rover's solar panel efficiency jumped from the original ~60% to 93%, followed on March 10, by the sighting of dust devils. NASA scientists speculate a dust devil must have swept the solar panels clean, possibly significantly extending the duration of the mission. This also marks the first time dust devils had been spotted by Spirit or Opportunity, and is easily one of the top highlights of the mission to date. Dust devils had previously only been photographed by the Pathfinder probe. Mission members monitoring Spirit on Mars reported on March 12, 2005 (sol 421), that a lucky encounter with a dust devil had cleaned the robot's solar panels. Energy levels dramatically increased and daily science work was anticipated to be expanded. Video of a dust devil on Mars, photographed by Spirit. The counter in the bottom-left corner indicates time in seconds after the first photo was taken in the sequence. At the final frames, one can see that the dust devil has left a trail on the Martian surface. Four other dust devils also appear in the background. As of August Spirit was only 100 metres (330 ft) away from the top. Here it was found that Husband Hill has two summits, with one a little higher than the other. On September 29 (sol 262), Spirit reached the real summit of Husband Hill. The rover was the first spacecraft to climb atop a mountain on another planet. The whole distance driven totaled 4971 meters. The summit itself was flat. Spirit took a 360 degree panorama in real color, which included the whole Gusev crater. At night the rover observed the moons Phobos and Deimos in order to determine their orbits better. On sol 656 Spirit surveyed the Mars sky and the opacity of the atmosphere with its pancam to make a coordinated science campaign with the Hubble Space Telescope in Earth orbit. From the peak Spirit spotted a striking formation, which was dubbed "Home Plate". This was an interesting target, but Spirit would be driven later to the McCool Hill to tilt its solar panels towards the sun in the coming winter. At the end of October the rover was driven downhill and to Home Plate. On the way down Spirit reached the rock formation named "Comanche" on sol 690. Scientists used data from all three spectrometers to find out that about one-fourth of the composition of Comanche is magnesium iron carbonate. That concentration is 10 times higher than for any previously identified carbonate in a Martian rock. Carbonates originate in wet, near-neutral conditions but dissolve in acid. The find at Comanche is the first unambiguous evidence from the Mars Exploration Mission rovers for a past Martian environment that may have been more favorable to life than the wet but acidic conditions indicated by the rovers' earlier finds. View from the Summit taken by Spirit on August 23, 2005, as the rover completed the climb up Husband Hill. Spirit's next stop was originally planned to be the north face of McCool Hill, where Spirit would receive adequate sunlight during the Martian winter. On March 16, 2006 JPL announced that Spirit's troublesome front wheel had stopped working altogether. Despite this, Spirit was still making progress toward McCool Hill because the control team programmed the rover to drive toward McCool Hill backwards, dragging its broken wheel. In late March, Spirit encountered loose soil that was impeding its progress toward McCool Hill. A decision was made to terminate attempts to reach McCool Hill and instead park on a nearby ridge named Low Ridge Haven. 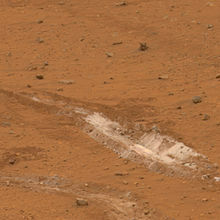 Spirit arrived at the north west corner of Home Plate, a raised and layered outcrop on sol 744 (February 2006) after an effort to maximize driving. Scientific observations were conducted with Spirit's robotic arm. Reaching the ridge on April 9, 2006 and parking on the ridge with an 11° incline to the north, Spirit spent the next eight months on the ridge, spending that time undertaking observations of changes in the surrounding area. No drives were attempted because of the low energy levels the rover was experiencing during the Martian winter. The rover made its first drive, a short turn to position targets of interest within reach of the robotic arm, in early November 2006, following the shortest days of winter and solar conjunction when communications with Earth were severely limited. While at Low Ridge, Spirit imaged two rocks of similar chemical nature to that of Opportunity's Heat Shield Rock, a meteorite on the surface of Mars. Named "Zhong Shan" for Sun Yat-sen and "Allan Hills" for the location in Antarctica where several Martian meteorites have been found, they stood out against the background rocks that were darker. Further spectrographic testing is being done to determine the exact composition of these rocks, which may turn out to also be meteorites. On January 4, 2007 (sol 1067), both rovers received new flight software to the onboard computers. The update was received just in time for the third anniversary of their landing. The new systems let the rovers decide whether or not to transmit an image, and whether or not to extend their arms to examine rocks, which would save much time for scientists as they would not have to sift through hundreds of images to find the one they want, or examine the surroundings to decide to extend the arms and examine the rocks. Spirit's dead wheel turned out to have a silver lining. As it was traveling in March 2007, pulling the dead wheel behind, the wheel scraped off the upper layer of the Martian soil, uncovering a patch of ground that scientists say shows evidence of a past environment that would have been perfect for microbial life. It is similar to areas on Earth where water or steam from hot springs came into contact with volcanic rocks. On Earth, these are locations that tend to teem with bacteria, said rover chief scientist Steve Squyres. "We're really excited about this," he told a meeting of the American Geophysical Union (AGU). The area is extremely rich in silica–the main ingredient of window glass. The researchers have now concluded that the bright material must have been produced in one of two ways. One: hot-spring deposits produced when water dissolved silica at one location and then carried it to another (i.e. a geyser). Two: acidic steam rising through cracks in rocks stripped them of their mineral components, leaving silica behind. "The important thing is that whether it is one hypothesis or the other, the implications for the former habitability of Mars are pretty much the same," Squyres explained to BBC News. Hot water provides an environment in which microbes can thrive and the precipitation of that silica entombs and preserves them. Squyres added, "You can go to hot springs and you can go to fumaroles and at either place on Earth it is teeming with life – microbial life." During 2007 Spirit spent several months near the base of the Home Plate plateau. On sol 1306 Spirit climbed onto the eastern edge of the plateau. In September and October it examined rocks and soils at several locations on the southern half of the plateau. On November 6, Spirit had reached the western edge of Home Plate, and started taking pictures for a panoramic overview of the western valley, with Grissom Hill and Husband Hill visible. The panorama image was published on NASA's website on January 3, 2008 to little attention, until January 23, when an independent website published a magnified detail of the image that showed a rock feature a few centimeters high resembling a humanoid figure seen from the side with its right arm partially raised. Towards the end of June 2007, a series of dust storms began clouding the Martian atmosphere with dust. The storms intensified and by July 20, both Spirit and Opportunity were facing the real possibility of system failure due to lack of energy. NASA released a statement to the press that said (in part) "We're rooting for our rovers to survive these storms, but they were never designed for conditions this intense". The key problem caused by the dust storms was a dramatic reduction in solar energy caused by there being so much dust in the atmosphere that it was blocking 99 percent of direct sunlight to Opportunity, and slightly more to Spirit. Normally the solar arrays on the rovers are able to generate up to 700 watt-hours (2,500 kJ) of energy per Martian day. After the storms, the amount of energy generated was greatly reduced to 128 watt-hours (460 kJ). If the rovers generate less than 150 watt-hours (540 kJ) per day they must start draining their batteries to run survival heaters. If the batteries run dry, key electrical elements are likely to fail due to the intense cold. Both rovers were put into the lowest-power setting in order to wait out the storms. In early August the storms began to clear slightly, allowing the rovers to successfully charge their batteries. They were kept in hibernation in order to wait out the remainder of the storm. The main concern was the energy level for Spirit. To increase the amount of light hitting the solar panels, the rover was parked in the northern part of Home Plate on as steep a slope as possible. It was expected that the level of dust cover on the solar panels would increase by 70 percent and that a slope of 30 degrees would be necessary to survive the winter. In February, a tilt of 29.9 degrees was achieved. Extra energy was available at times, and a high definition panorama named Bonestell was produced. At other times when there was only enough solar energy to recharge the batteries, communication with Earth was minimized and all unnecessary instruments were switched off. At winter solstice the energy production declined to 235 watt hours per sol. On November 10, 2008, a large dust storm further reduced the output of the solar panels to 89 watt-hours (320 kJ) per day—a critically low level. NASA officials were hopeful that Spirit would survive the storm, and that the energy level would rise once the storm had passed and the skies started clearing. They attempted to conserve energy by shutting down systems for extended periods of time, including the heaters. On November 13, 2008 the rover awoke and communicated with mission control as scheduled. From November 14, 2008 to November 20, 2008 (sols 1728 to 1734), Spirit averaged 169 watt-hours (610 kJ) per day. The heaters for the thermal emission spectrometer, which used about 27 watt-hours (97 kJ) per day, were disabled on November 11, 2008. Tests on the thermal emission spectrometer indicate that it was undamaged, and the heaters would be enabled with sufficient energy. The solar conjunction, where the Sun is between Earth and Mars, started on November 29, 2008 and communication with the rovers was not possible until December 13, 2008. On February 6, 2009, a beneficial wind blew off some of the dust accumulated on the panels. This led to an increase in energy output to 240 watt-hours (860 kJ) per day. NASA officials stated that this increase in energy was to be used predominantly for driving. On April 18, 2009 (sol 1879) and April 28, 2009 (sol 1889) energy output of the solar arrays were increased by cleaning events. The energy output of Spirit's solar arrays climbed from 223 watt-hours (800 kJ) per day on March 31, 2009 to 372 watt-hours (1,340 kJ) per day on April 29, 2009. Engineers attempt to replicate conditions in the laboratory of Spirit's entrapment on a rock and in fluffy material churned by the rover's left-front wheel. On May 1, 2009 (sol 1892), the rover became stuck in soft sand, the machine resting upon a cache of iron(III) sulfate (jarosite) hidden under a veneer of normal-looking soil. Iron sulfate has very little cohesion, making it difficult for the rover's wheels to gain traction. JPL team members simulated the situation by means of a rover mock-up and computer models in an attempt to get the rover back on track. To reproduce the same soil mechanical conditions on Earth as those prevailing on Mars under low gravity and under very weak atmospheric pressure, tests with a lighter version of a mock-up of Spirit were conducted at JPL in a special sandbox to attempt to simulate the cohesion behavior of poorly consolidated soils under low gravity. Preliminary extrication drives began on November 17, 2009. On December 17, 2009 (sol 2116), the right-front wheel suddenly began to operate normally for the first three out of four rotations attempts. It was unknown what effect it would have on freeing the rover if the wheel became fully operational again. The right rear wheel had also stalled on November 28 (sol 2097) and remained inoperable for the remainder of the mission. This left the rover with only four fully operational wheels. If the team could not gain movement and adjust the tilt of the solar panels, or gain a beneficial wind to clean the panels, the rover would only be able to sustain operations until May 2010. On January 26, 2010 (sol 2155), after several months attempting to free the rover, NASA decided to redefine the mobile robot mission by calling it a stationary research platform. Efforts were directed in preparing a more suitable orientation of the platform in relation to the Sun in an attempt to allow a more efficient recharge of the platform's batteries. This was needed to keep some systems operational during the Martian winter. On March 30, 2010, Spirit skipped a planned communication session and as anticipated from recent power-supply projections, had probably entered a low-power hibernation mode. Spirit's concluding journey around Homeplate and ending location. The last communication with the rover was March 22, 2010 (sol 2208) and there is a strong possibility the rover’s batteries lost so much energy at some point that the mission clock stopped. In previous winters the rover was able to park on a Sun-facing slope and keep its internal temperature above −40 °C (−40 °F), but since the rover was stuck on flat ground it is estimated that its internal temperature dropped to −55 °C (−67 °F). If Spirit had survived these conditions and there had been a cleaning event, there was a possibility that with the southern summer solstice in March 2011, solar energy would increase to a level that would wake up the rover. Spirit remains silent at its location, called "Troy," on the west side of Home Plate. As of 2018[update], there has been no communication with the rover since March 22, 2010 (sol 2208). It is likely that Spirit experienced a low-power fault and had turned off all sub-systems, including communication, and gone into a deep sleep, trying to recharge its batteries. It is also possible that the rover had experienced a mission clock fault. If that had happened, the rover would have lost track of time and tried to remain asleep until enough sunlight struck the solar arrays to wake it. This state is called "Solar Groovy." If the rover woke up from a mission clock fault, it would only listen. Starting on July 26, 2010 (sol 2331), a new procedure to address the possible mission clock fault was implemented. Each sol, the Deep Space Network mission controllers sent a set of X-band "Sweep & Beep" commands. If the rover had experienced a mission clock fault and then had been awoken during the day, it would have listened during brief, 20-minute intervals during each hour awake. Due to the possible clock fault, the timing of these 20-minute listening intervals was not known, so multiple "Sweep & Beep" commands were sent. If the rover heard one of these commands, it would have responded with an X-band beep signal, updating the mission controllers on its status and allowing them to investigate the state of the rover further. But even with this new strategy, there was no response from the rover. The rover had driven 7,730.50 metres (4.80351 mi) until it became immobile. JPL continued attempts to regain contact with Spirit until May 25, 2011, when NASA announced the end of contact efforts and the completion of the mission. According to NASA, the rover likely experienced excessively cold "internal temperatures" due to "inadequate energy to run its survival heaters" that, in turn, was a result of "a stressful Martian winter without much sunlight." Many critical components and connections would have been "susceptible to damage from the cold." Assets that had been needed to support Spirit were transitioned to support Spirit's "still-active twin", Opportunity, as well as the next-generation Mars rover Curiosity. The rocks on the plains of Gusev are a type of basalt. They contain the minerals olivine, pyroxene, plagioclase, and magnetite, and they look like volcanic basalt as they are fine-grained with irregular holes (geologists would say they have vesicles and vugs). Annotated panorama of rocks near Spirit (April, 2006). Much of the soil on the plains came from the breakdown of the local rocks. Fairly high levels of nickel were found in some soils; probably from meteorites. Analysis shows that the rocks have been slightly altered by tiny amounts of water. Outside coatings and cracks inside the rocks suggest water deposited minerals, maybe bromine compounds. All the rocks contain a fine coating of dust and one or more harder rinds of material. One type can be brushed off, while another needed to be ground off by the Rock Abrasion Tool (RAT). Above: An approximate true-color view of Adirondack, taken by Spirit's pancam. Observations of rocks on the plains show they contain the minerals pyroxene, olivine, plagioclase, and magnetite. These rocks can be classified in different ways. The amounts and types of minerals make the rocks primitive basalts—also called picritic basalts. The rocks are similar to ancient terrestrial rocks called basaltic komatiites. Rocks of the plains also resemble the basaltic shergottites, meteorites that came from Mars. One classification system compares the amount of alkali elements to the amount of silica on a graph; in this system, Gusev plains rocks lie near the junction of basalt, picrobasalt, and tephrite. The Irvine-Barager classification calls them basalts. Plains rocks have been very slightly altered, probably by thin films of water because they are softer and contain veins of light colored material that may be bromine compounds, as well as coatings or rinds. It is thought that small amounts of water may have gotten into cracks inducing mineralization processes). Coatings on the rocks may have occurred when rocks were buried and interacted with thin films of water and dust. One sign that they were altered was that it was easier to grind these rocks compared to the same types of rocks found on Earth. Cross-sectional drawing of a typical rock from the plains of Gusev crater. Most rocks contain a coating of dust and one or more harder coatings. Veins of water-deposited minerals are visible, along with crystals of olivine. Veins may contain bromine salts. Scientists found a variety of rock types in the Columbia Hills, and they placed them into six different categories. The six are: Clovis, Wishbone, Peace, Watchtower, Backstay, and Independence. They are named after a prominent rock in each group. Their chemical compositions, as measured by APXS, are significantly different from each other. Most importantly, all of the rocks in Columbia Hills show various degrees of alteration due to aqueous fluids. They are enriched in the elements phosphorus, sulfur, chlorine, and bromine—all of which can be carried around in water solutions. The Columbia Hills’ rocks contain basaltic glass, along with varying amounts of olivine and sulfates. The olivine abundance varies inversely with the amount of sulfates. This is exactly what is expected because water destroys olivine but helps to produce sulfates. Acid fog is believed to have changed some of the Watchtower rocks. This was in a 200 metres (660 ft) long section of Cumberland Ridge and the Husband Hill summit. Certain places became less crystalline and more amorphous. Acidic water vapor from volcanoes dissolved some minerals forming a gel. When water evaporated a cement formed and produced small bumps. This type of process has been observed in the lab when basalt rocks are exposed to sulfuric and hydrochloric acids. The Clovis group is especially interesting because the Mössbauer spectrometer (MB) detected goethite in it. Goethite forms only in the presence of water, so its discovery is the first direct evidence of past water in the Columbia Hills's rocks. In addition, the MB spectra of rocks and outcrops displayed a strong decline in olivine presence, although the rocks probably once contained much olivine. Olivine is a marker for the lack of water because it easily decomposes in the presence of water. Sulfate was found, and it needs water to form. Wishstone contained a great deal of plagioclase, some olivine, and anhydrate (a sulfate). Peace rocks showed sulfur and strong evidence for bound water, so hydrated sulfates are suspected. Watchtower class rocks lack olivine consequently they may have been altered by water. The Independence class showed some signs of clay (perhaps montmorillonite a member of the smectite group). Clays require fairly long term exposure to water to form. One type of soil, called Paso Robles, from the Columbia Hills, may be an evaporate deposit because it contains large amounts of sulfur, phosphorus, calcium, and iron. Also, MB found that much of the iron in Paso Robles soil was of the oxidized, Fe3+ form, which would happen if water had been present. In summary, Spirit found evidence of slight weathering on the plains of Gusev, but no evidence that a lake was there. However, in the Columbia Hills there was clear evidence for a moderate amount of aqueous weathering. The evidence included sulfates and the minerals goethite and carbonates that only form in the presence of water. It is believed that Gusev crater may have held a lake long ago, but it has since been covered by igneous materials. All the dust contains a magnetic component that was identified as magnetite with some titanium. Furthermore, the thin coating of dust that covers everything on Mars is the same in all parts of Mars. Spirit pointed its cameras towards the sky and observed a transit of the Sun by Mars' moon Deimos (see Transit of Deimos from Mars). It also took the first photo of Earth from the surface of another planet in early March 2004. In late 2005, Spirit took advantage of a favorable energy situation to make multiple nighttime observations of both of Mars' moons Phobos and Deimos. These observations included a "lunar" (or rather phobian) eclipse as Spirit watched Phobos disappear into Mars' shadow. Some of Spirit's star gazing was designed to look for a predicted meteor shower caused by Halley's Comet, and although at least four imaged streaks were suspect meteors, they could not be unambiguously differentiated from those caused by cosmic rays. Both rovers passed their original mission time of 90 sols many times over. The extended time on the surface, and therefore additional stress on components, resulted in some issues developing. On March 13, 2006 (sol 778), the right front wheel ceased working after having covered 4.2 mi (7 km) on Mars. Engineers began driving the rover backwards, dragging the dead wheel. Although this resulted in changes to driving techniques, the dragging effect became a useful tool, partially clearing away soil on the surface as the rover traveled, thus allowing areas to be imaged that would normally be inaccessible. However, in mid-December 2009, to the surprise of the engineers, the right front wheel showed slight movement in a wheel-test on sol 2113 and clearly rotated with normal resistance on three of four wheel-tests on sol 2117, but stalled on the fourth. On Nov 29, 2009 (sol 2098), the right rear wheel also stalled and remained inoperable for the remainder of the mission. Scientific instruments also experienced degradation as a result of exposure to the harsh Martian environment and use over a far longer period than had been anticipated by the mission planners. Over time, the diamond in the resin grinding surface of the Rock Abrasion Tool wore down, after that the device could only be used to brush targets. All of the other science instruments and engineering cameras continued to function until contact was lost; however, towards the end of Spirit's life, the MIMOS II Mössbauer spectrometer took much longer to produce results than it did earlier in the mission because of the decay of its cobalt-57 gamma ray source that has a half life of 271 days. To commemorate Spirit's great contribution to the exploration of Mars, the asteroid 37452 Spirit has been named after it. The name was proposed by Ingrid van Houten-Groeneveld who along with Cornelis Johannes van Houten and Tom Gehrels discovered the asteroid on September 24, 1960. Reuben H. Fleet Science Center and the Liberty Science Center also have an IMAX show called Roving Mars that documents the journey of both Spirit and Opportunity, using both CG and actual imagery. January 4, 2014 was celebrated as the tenth anniversary of its landing on many news sites, despite nearly four years since loss of communications. To honor the rover, the JPL team named an area near Endeavour Crater explored by the Opportunity rover, 'Spirit Point'. On January 27, 2004 (sol 22) NASA memorialized the crew of Apollo 1 by naming three hills to the north of "Columbia Memorial Station" as the Apollo 1 Hills. On February 2, 2004 (sol 28) the astronauts on Space Shuttle Columbia's final mission were further memorialized when NASA named a set of hills to the east of the landing site the Columbia Hills Complex, denoting seven peaks in that area as "Anderson", "Brown", "Chawla", "Clark", "Husband", "McCool", and "Ramon"; NASA has submitted these geographical feature names to the IAU for approval. The rover can take pictures with its different cameras. But only the PanCam camera has the ability to photograph a scene with different color filters. The panorama views are usually built up from PanCam images. Spirit has transferred 128,224 pictures in its lifetime. False color image of "Mimi". Color panorama taken from "Larry's Lookout". On the far left is "Tennessee Valley" and on the right, rover tracks. Spirit's West Valley panorama (color not rectificated for media). NASA'S Mars Exploration Rover Spirit captured this westward view from atop a low plateau where Spirit spent the closing months of 2007. Erosive effect of winds on hardened lava. Map of the movement of the Spirit rover up to 2008. ^ [http:mars.jpl.nasa.gov/mer/mission/spacecraft.html "Mars Exploration Rovers"]. NASA. Retrieved December 6, 2018. ^ a b c Nelson, Jon. "Mars Exploration Rover - Spirit". NASA. Retrieved February 2, 2014. ^ a b "Launch Event Details – When did the Rovers Launch?". Retrieved April 25, 2009. ^ Staff. "Mapping the Mars Rovers' Landing Sites". Esri. Retrieved May 4, 2014. ^ "NASA Spirit Rover Completes Mission on Mars" (Press release). Jet Propulsion Laboratory. May 25, 2011. Retrieved May 26, 2011. ^ "Special Issue: Spirit at Gusev Crater". Science. 305 (5685): 737–900. August 6, 2004. ^ Henry Fountain (May 26, 2009). "Crater was Shaped by Wind and Water, Mars Rover Data Shows". New York Times. ^ Amos, Jonathan (January 26, 2010). "Nasa accepts Spirit Mars rover 'stuck for good'". BBC News. The US space agency (Nasa) has conceded defeat in its battle to free the Spirit rover from its Martian sand trap. The vehicle became stuck in soft soil back in May last year and all the efforts to extricate it have failed. ^ Brown, Dwayne; Webster, Guy (January 26, 2010). "Now a Stationary Research Platform, NASA's Mars Rover Spirit Starts a New Chapter in Red Planet Scientific Studies". NASA (Press release). Retrieved January 26, 2010. Washington – After six years of unprecedented exploration of the Red Planet, NASA's Mars Exploration Rover Spirit no longer will be a fully mobile robot. NASA has designated the once-roving scientific explorer a stationary science platform after efforts during the past several months to free it from a sand trap have been unsuccessful. ^ September 30 – October 5, 2010 Spirit Remains Silent at Troy NASA. 2010-10-05. ^ a b c Webster, Guy (May 25, 2011). "NASA's Spirit Rover Completes Mission on Mars". NASA. Retrieved October 12, 2011. ^ "NASA's Spirit Rover Completes Mission on Mars". NASA/JPL. ^ a b c "NASA Concludes Attempts to Contact Mars Rover Spirit". NASA. Retrieved May 25, 2011. ^ a b "Spirit Update Archive". NASA/JPL. Retrieved May 4, 2009. ^ "Spirit Updates". Retrieved May 14, 2012. ^ "Mars Exploration Rover Mission: Science". marsrovers.nasa.gov. ^ "Mars Exploration Rover Mission: The Mission". marsrovers.jpl.nasa.gov. ^ "Gusev Crater: LandingSites". marsoweb.nas.nasa.gov. ^ "APOD: 2004 January 14 - A Mars Panorama from the Spirit Rover". antwrp.gsfc.nasa.gov. ^ "MER color imagery, methods". Archived from the original on April 24, 2005. ^ Webster, Guy (January 19, 2004). "Spirit Drives to a Rock Called 'Adirondack' for Close Inspection" (Press release). NASA. Retrieved January 2, 2018. ^ Webster, Guy (February 9, 2004). "Mars Rover Pictures Raise 'Blueberry Muffin' Questions" (Press release). NASA. Retrieved January 2, 2018. ^ mars.nasa.gov. "Mars Exploration Rover". marsrovers.jpl.nasa.gov. ^ "Mars Rovers Surprises Continue". JPL website. Retrieved October 6, 2006. ^ "Mars Exploration Rover Mission: All Spirit Updates". marsrovers.jpl.nasa.gov. ^ David, Leonard (March 12, 2005). "Spirit Gets A Dust Devil Once-Over". Space.com. Retrieved December 1, 2006. ^ "NASA - Carbonate-Containing Martian Rocks (False Color)". www.nasa.gov. ^ "NASA - NASA Mars Rovers Head for New Sites After Studying Layers". www.nasa.gov. ^ "Old rovers learn new tricks". CBC News. January 4, 2007. ^ Amos, Jonathan (December 11, 2007). 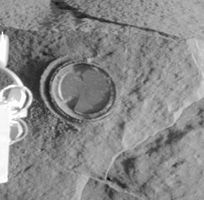 "Mars robot unearths microbe clue" (web). NASA says its robot rover Spirit has made one of its most significant discoveries on the surface of Mars. BBC News. Retrieved December 12, 2007. ^ Bertster, Guy (December 10, 2007). "Mars Rover Investigates Signs of Steamy Martian Past" (Web). Press Release. Jet Propulsion Laboratory, Pasadena, California. Retrieved December 12, 2007. ^ Nemiroff, R.; Bonnell, J., eds. (January 29, 2008). "Spirit's West Valley Panorama image". Astronomy Picture of the Day. NASA. ^ "NASA Mars Rovers Braving Severe Dust Storms" (Press release). Jet Propulsion Laboratory. July 27, 2007. Retrieved August 21, 2009. ^ "Martian Skies Brighten Slightly" (Press release). Jet Propulsion Laboratory. August 7, 2007. Retrieved August 21, 2009. ^ "Dust Storm Cuts Energy Supply of NASA Mars Rover Spirit" (Press release). Jet Propulsion Laboratory. November 10, 2008. Retrieved August 21, 2009. ^ Courtland, Rachel (November 14, 2009). "Spirit rover recuperating after dust storm". New Scientist. Retrieved August 21, 2009. ^ "sol 1730–1736, November 14–20, 2008: Serious but Stable" (Press release). Jet Propulsion Laboratory. November 20, 2008. Retrieved August 21, 2009. ^ "sol 1709–1715, November 13–19, 2008: Opportunity Prepares for Two Weeks of Independent Study" (Press release). Jet Propulsion Laboratory. November 19, 2008. Retrieved August 21, 2009. ^ "Spirit Gets Energy Boost from Cleaner Solar Panels". NASA/JPL. Retrieved February 17, 2009. ^ "Another Reset and a Cleaning Event". NASA/JPL. April 22, 2009. Retrieved April 25, 2009. ^ a b "Well Behaved, Less Dusty, in Difficult Terrain". NASA/JPL. April 29, 2009. Retrieved May 4, 2009. ^ Maggie McKee (May 12, 2009). "Mars rover may not escape sand trap for weeks". New Scientist. ^ Chang, Kenneth (May 19, 2009). "Mars rover's 5 working wheels are stuck in hidden soft spot". The New York Times. ISSN 0362-4331. Retrieved May 19, 2009. ^ "Free Spirit - jpl.nasa.gov". www.jpl.nasa.gov. ^ "A How a Sandbox Could Save Mars Rover". sphere.com. December 10, 2009. Archived from the original on January 17, 2010. ^ "Right-Front Wheel Rotations". NASA. December 17, 2009. ^ "NASA's Mars Rover has Uncertain Future as Sixth Anniversary Nears". NASA. December 31, 2009. Retrieved January 1, 2010. ^ "Now A Stationary Research Platform, NASA's Mars Rover Spirit Starts a New Chapter in Red Planet Scientific Studies". NASA. January 26, 2010. ^ "Spirit May Have Begun Months-Long Hibernation". NASA. March 31, 2010. ^ "Spirit status". NASA. Retrieved February 28, 2011. ^ a b Reisert, Sarah (2017). "Life on Mars". Distillations. 3 (1): 42–45. Retrieved April 13, 2018. ^ Atkinson, Nancy (May 25, 2011). "End of the Road for Spirit Rover". Universe Today. Retrieved May 25, 2011. ^ a b c McSween, HY; Arvidson, RE; Bell Jf, 3rd; Blaney, D; Cabrol, NA; Christensen, PR; Clark, BC; Crisp, JA; et al. (2004). "Basaltic Rocks Analyzed by the Spirit Rover in Gusev Crater". Science. 305 (5685): 842–845. doi:10.1126/science.3050842. PMID 15297668. ^ a b Arvidson, R. E.; Anderson, RC; Bartlett, P; Bell Jf, 3rd; Blaney, D; Christensen, PR; Chu, P; Crumpler, L; et al. (2004). "Localization and physical properties experiments conducted by Spirit at Gusev Crater". Science. 305 (5685): 821–824. Bibcode:2004Sci...305..821A. doi:10.1126/science.1099922. PMID 15297662. ^ Gellert, R.; Rieder, R.; Brückner, J.; Clark, B. C.; Dreibus, G.; Klingelhöfer, G.; Lugmair, G.; Ming, D. W.; et al. (2006). "Alpha Particle X-Ray Spectrometer (APXS): Results from Gusev crater and calibration report". Journal of Geophysical Research. 111 (E2): n/a. Bibcode:2006JGRE..111.2S05G. doi:10.1029/2005JE002555. ^ Christensen, P.; Ruff, SW; Fergason, RL; Knudson, AT; Anwar, S; Arvidson, RE; Bandfield, JL; Blaney, DL; et al. (2004). "Initial Results from the Mini-TES Experiment in Gusev Crater from the Spirit Rover". Science. 305 (5685): 837–842. Bibcode:2004Sci...305..837C. doi:10.1126/science.1100564. PMID 15297667. ^ Bertelsen, P.; Goetz, W; Madsen, MB; Kinch, KM; Hviid, SF; Knudsen, JM; Gunnlaugsson, HP; Merrison, J; et al. (2004). "Magnetic Properties on the Mars Exploration Rover Spirit at Gusev Crater". Science. 305 (5685): 827–829. Bibcode:2004Sci...305..827B. doi:10.1126/science.1100112. PMID 15297664. ^ Gelbert, R. (2004). "Chemistry of Rocks and Soils in Gusev Crater from the Alpha Particle X-ray Spectrometer". Science. 305 (5685): 829–832. Bibcode:2004Sci...305..829G. doi:10.1126/science.1099913. PMID 15297665. ^ Squyres, Steven W.; Arvidson, Raymond E.; Blaney, Diana L.; Clark, Benton C.; Crumpler, Larry; Farrand, William H.; Gorevan, Stephen; Herkenhoff, Kenneth E.; et al. (2006). "Rocks of the Columbia Hills". Journal of Geophysical Research. 111 (E2): n/a. Bibcode:2006JGRE..111.2S11S. doi:10.1029/2005JE002562. ^ a b Ming, D. W.; Mittlefehldt, D. W.; Morris, R. V.; Golden, D. C.; Gellert, R.; Yen, A.; Clark, B. C.; Squyres, S. W.; et al. (2006). "Geochemical and mineralogical indicators for aqueous processes in the Columbia Hills of Gusev crater, Mars". Journal of Geophysical Research. 111 (E2): n/a. Bibcode:2006JGRE..111.2S12M. doi:10.1029/2005JE002560. ^ a b Schroder, C. (2005). "European Geosciences Union, General Assembly". Geophysical Research Abstracts. 7: 10254. ^ "Signs of Acid Fog Found on Mars - SpaceRef". spaceref.com. ^ "Abstract: IN-SITU EVIDENCE FOR ALTERATION BY ACID FOG ON HUSBAND HILL, GUSEV CRATER, MARS (2015 GSA Annual Meeting in Baltimore, Maryland, USA (1-4 November 2015))". gsa.confex.com. ^ Morris, R. V.; Klingelhöfer, G.; Schröder, C.; Rodionov, D. S.; Yen, A.; Ming, D. W.; De Souza, P. A.; Fleischer, I.; et al. (2006). "Mössbauer mineralogy of rock, soil, and dust at Gusev crater, Mars: Spirit's journey through weakly altered olivine basalt on the plains and pervasively altered basalt in the Columbia Hills". Journal of Geophysical Research. 111 (E2): n/a. Bibcode:2006JGRE..111.2S13M. doi:10.1029/2005JE002584. ^ "Mars Rover Uncovers Ancient Hot Springs". SkyandTelescope.com. May 22, 2008. Retrieved August 1, 2012. ^ "NASA - Mars Rover Spirit Unearths Surprise Evidence of Wetter Past". www.nasa.gov. ^ "Outcrop of long-sought rare rock on Mars found". ^ Morris, R. V.; Ruff, S. W.; Gellert, R.; Ming, D. W.; Arvidson, R. E.; Clark, B. C.; Golden, D. C.; Siebach, K.; et al. (2010). "Identification of Carbonate-Rich Outcrops on Mars by the Spirit Rover". Science. 329 (5990): 421–4. Bibcode:2010Sci...329..421M. doi:10.1126/science.1189667. PMID 20522738. ^ Chamberlin, Alan. "HORIZONS System". ssd.jpl.nasa.gov. ^ "JPL.NASA.GOV: Mars Exploration Rovers". www-b.jpl.nasa.gov. 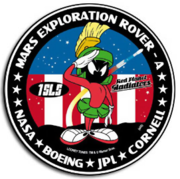 ^ "NASAʼs Mars rovers and Steve Squyres keep going and going - Cornell Chronicle". www.news.cornell.edu. ^ "Mars Exploration Rover Mission: Spotlight". marsrovers.nasa.gov. ^ "Spaceflight Now - Mars Exploration Rovers - Revered Spirit rover landed on Mars a decade ago". www.spaceflightnow.com. ^ Greicius, Tony; Dunbar, Brian (August 10, 2011). "Arrival at 'Spirit Point' by Mars Rover Opportunity". NASA. Retrieved February 2, 2014. ^ "Catalog Page for PIA01879". photojournal.jpl.nasa.gov.